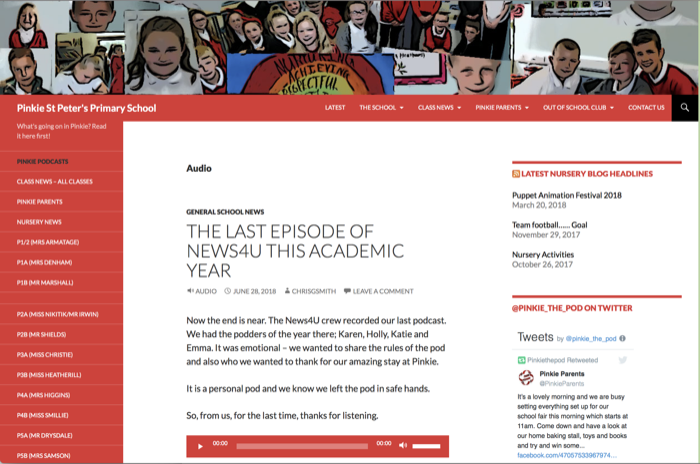 Pinkie St Peter’s Primary School Podcast is a podcast published on East Lothian’s Edubuzz blogging platform, you can do the same thing on Glow Blogs. We are living in a media centric world many young learners’ first port of call is youtube. A blog makes it easy to collate and share multimedia resources and publish you own or have your pupils publish their’s. Provide a showcase for multimedia content your pupils are creating. Give pupils an audience and some purpose for their work. Involve pupils in publishing to increase ownership of learning. Feedback in comments can provide extra encouragement and formative assessment. Collate resources from Youtube, Vimeo and other multimedia sites. Tips: Make sure your media is is a format that can be played inline. Learn how to balance file size and quality. For example 64 bit mp3 audio files are smaller and fine for speech. You might need to use 128 bit if your pupils are producing music.